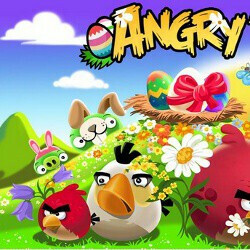 Weeks after the release of Angry Birds Rio, just in time to feed your game addiction, Angry Birds Seasons: Easter, an update to Angry Birds Seasons, arrives bringing 15 new egg-popping fun levels featuring the familiar set of upset birds facing bunny-clad pigs as the arch-enemy. This update is free for owners of the Angry Birds Seasons edition in both its phone and tablet optimized versions for iDevices, while for Android an ad-sponsored edition of Seasons edition was initially available for free. Three Eastery golden eggs can also be unlocked adding challenge to the fun. Folks from Rovio are definitely not letting the hype die down - after Halloween, Christmas, Valentine's Day and St. Patrick's Day updates, what could be next?